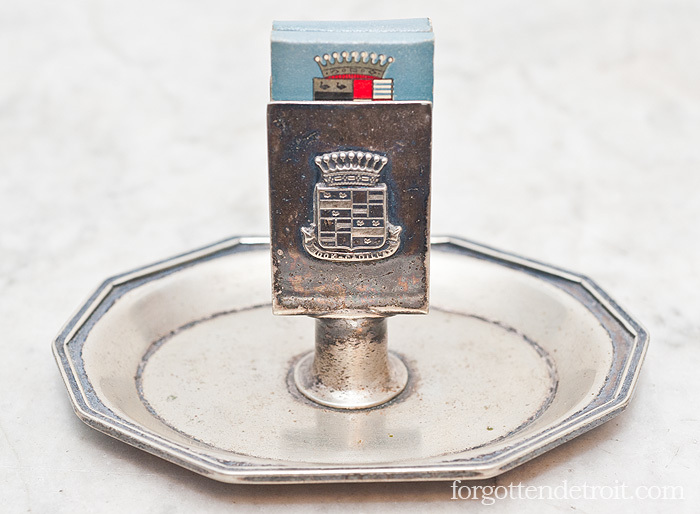 A while back I showed off a few pieces from my collection of Book-Cadillac artifacts by highlighting china from the hotel’s 1924 general restaurant service. 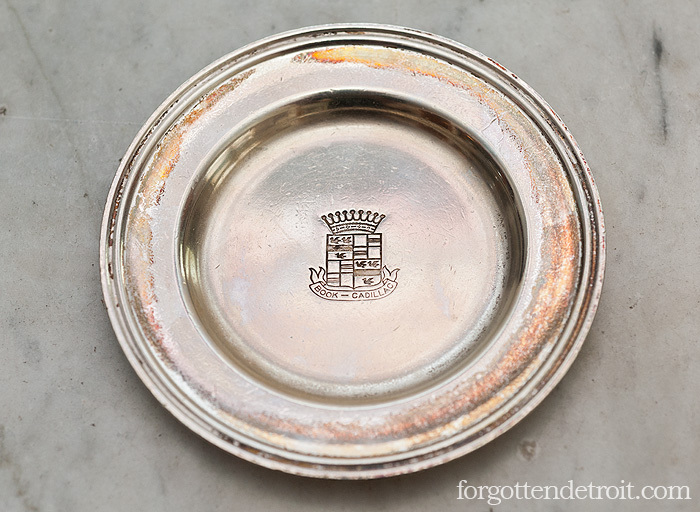 This edition of show and tell continues that theme by focusing on the hotel’s original silver service. Granted, I haven’t collected Book-Cadillac silver with quite the same enthusiasm as its china. For one thing, the silver doesn’t come in the wide array of designs that the china does. More importantly, it is harder to find, frequently in terrible condition, and stupid expensive. 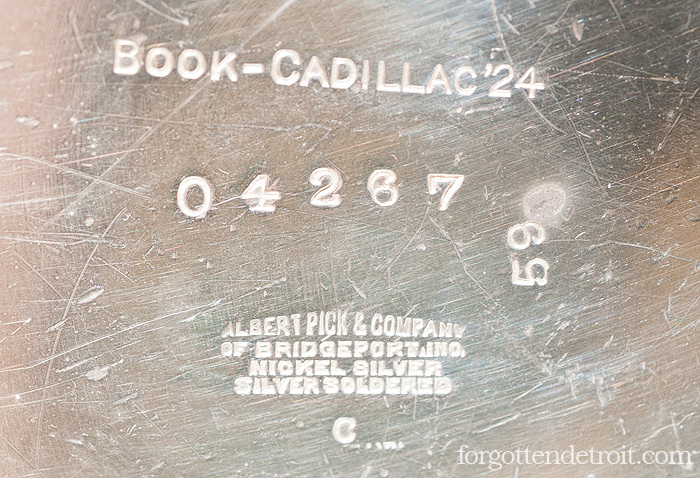 As with the rest of the hotel’s furnishings, the Book-Cadillac contracted with the Albert Pick Company to supply the entire silver service. 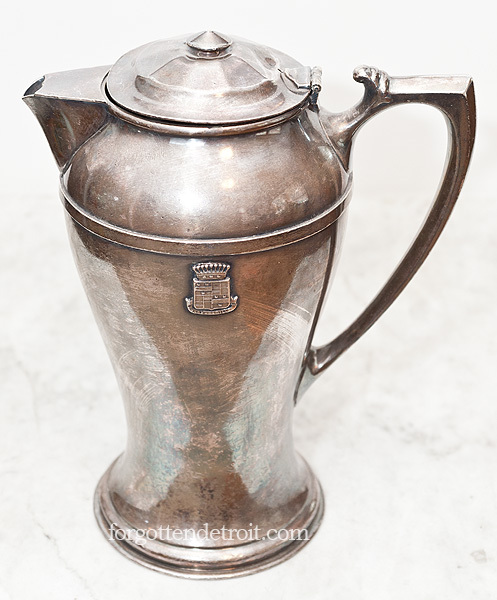 However, unlike the china, which was sourced from multiple international manufacturers, Albert Pick manufactured the silver itself at its factory in Bridgeport, Connecticut. The initial order included well over 40,000 pieces, a volume so great that an entire boxcar was required to ship it. Evidently this was a rare feat, as the Hotel Bulletin felt it worthy to brag about. 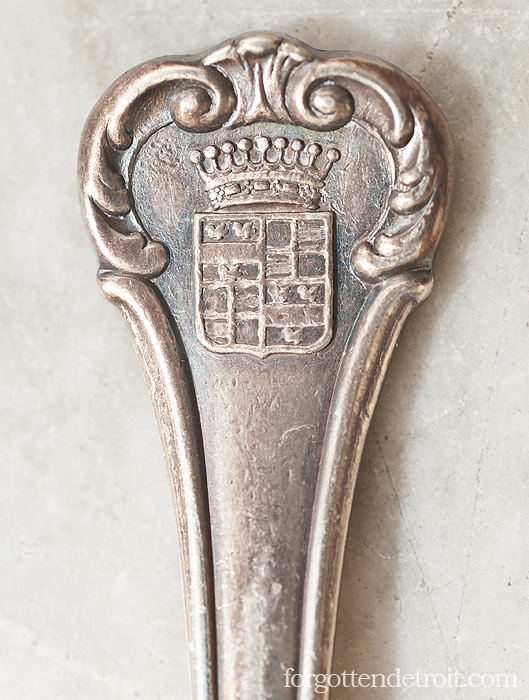 The underside of each piece is stamped with the hotel’s name, the year the piece was manufactured, and the manufacturer. The stamp also tells us that the “silver” is made of nickel silver, which is an alloy of copper, nickel, and zinc. It has a silver color, but contains no actual silver. The only actual silver content came from an electroplated silver coating added on top of the nickel silver base. This is the standard method of construction for “silver” service used in commercial environments. It wasn’t an attempt to be cheap, rather it was a necessity. Pure silver is too soft and can not hold up to the rigors of day-to-day hotel use. Despite the heavy-duty construction, most silver hotelware I’ve seen is in pretty rough shape. Logos are worn to the point of being unrecognizable, the surface is covered in dings, and sometimes most of the silver plating has come off. Sure, you would expect the pieces to have gone through hell during their service. But you would also expect the hotel to have some standards for the appearance of the silver they presented to the public, and that the pieces would be retired long before they got that bad. For the record, I shy away from the poorer examples, so these are some of the better items that I’ve come across. As for the decoration, they are relatively simple. 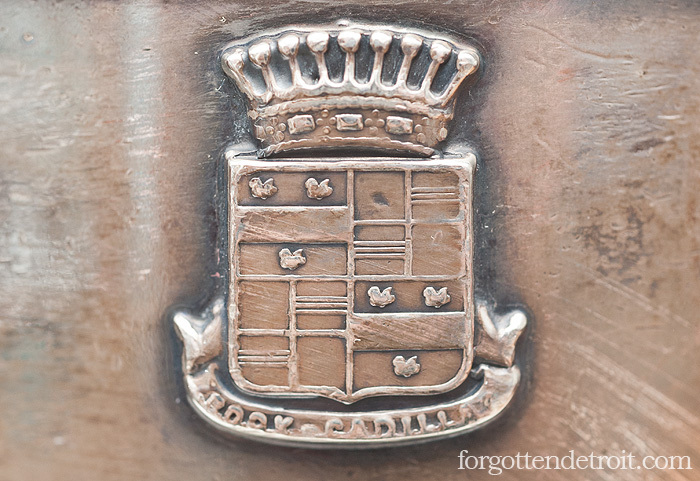 The only real ornament found on most pieces is the signature Cadillac crest, with “Book-Cadillac” spelled out underneath in a ribbon. Interestingly enough, the cute little ducks on the crest are flapping their tiny wings. This is the only version of the hotel’s logo where I’ve seen this. I guess either the folks at Albert Pick didn’t pay enough attention to the specifications, or I am being too nick-picky. Anyho, the only variation is the form and function of the individual pieces. I’ve seen everything from creamers, pots, trays, and plates and they all conform to the same design standard. The flatware is the exception, with long handles done up with a floral design described at the time as being French in character. Overall, I would say the pieces are nice looking, but as noted, I prefer the china service, which was individually designed for the space in which it was used. I suspect I’ll never know the full range of silver made for the hotel. It seems that almost every time I see something, it is something new. Larger items, such as pots and pans, are rare. Flatware, on the other hand, is common. Obviously it made up the vast bulk of that initial 40,000+ piece order. It is also true that spoons are easier to pocket as a souvenir than a coffee pot, so the hotel probably had to replace them more often. In a funny story, my parents once stayed at a bed and breakfast out east that uses antique flatware in its day-to-day service. (!!!) Well, for one meal my dad ended up with a Book-Cadillac knife with his place setting, told the owner about me, and asked if he could take it home. So, that is where my knife came from. With the exception of some silverware, what you see in this post is the entirety of my 1924 Book-Cadillac silver service. I do have some later pieces, dating from the 1930s and 1940s. However, these are a different design. The hotel’s logo, with its cute flapping ducks, was ditched in favor of a more deco look. The only indication that the piece came from the hotel is the back stamp. These new designs were probably put into use as the original dining rooms were replaced by the modern Book Casino and Esquire Room. I leave you with this image from the 1986 liquidation sale, held just prior to the Book-Cadillac’s 20+ year nap. 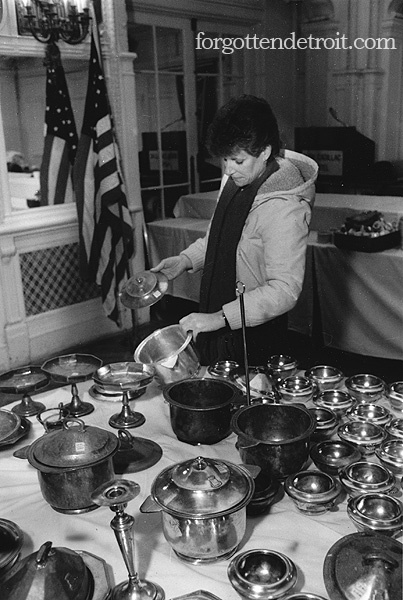 We see a woman examining a tableful of silver pots set up in the Grand Ballroom. A few of these pieces are clearly from the original 1924 service, the distinctive Cadillac crest plainly visible. It is honestly quite amazing to me that they stayed with the hotel for 60 years. They were probably not used after Sheraton took over in 1951, and may have been in storage for a good chunk of the building’s operational life, but still. It is even more amazing that these original pieces could have been had for bargain liquidation prices. Yikes. I hope, for her sake, that she ended up purchasing one, or two, or all of them! Hi, I have two 1946 butter knives if you’re interested.